Image Size: 27" x 17.5"
Paper Size: 33.5" x 25"
Capt. Robert K. Morgan and his crew climb out over the English countryside and the eighth Air Force Base, Bovingdon, 9 June 1943. This time, having completed their 25th mission over enemy territory the previous month, they are heading the other way, northwest across Scotland, then across the Atlantic Ocean for the United States...and home! The aircraft and crew spent the next two months flying around the country on a War Bond promotional tour. 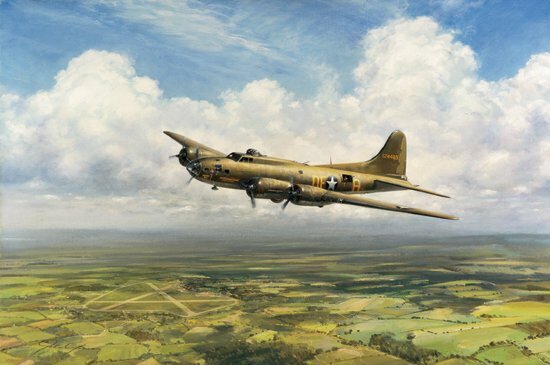 The "Memphis Belle" became a household word and certainly one synonymous with B-17s and World War II. Saved from the smelter at the end of the war, the "Memphis Belle" was restored and put on display in the city of her namesake. Personally autographed by pilot Robert K. "Bob" Morgan.